Can workplace design change your company culture? Workplace design is big business with commercial rents on the rise and companies constantly striving for better employee engagement. The office is probably the single biggest visual indicator of how much an employer cares about its workforce. But to what extent can a new workplace change your company culture and the way your people work and interact with each other? The Confederation of British Industry (CBI) is the UK’s top lobbying organisation. After 40 years at the iconic but inadequate Centre Point on top of Tottenham Court Road tube station, the CBI moved to a brand new office space in the City, this time above Cannon Street station. Financial Times journalist Lucy Kellaway takes you on a tour of the 25,000 sq ft Cannon Place project in the video below. She reveals how this was: “the ultimate test of the modern office to transform” with the CBI wanting a more colourful, open plan design that would make its workers more vibrant and cohesive. K2 Space marketing director Graham Smith spent three years working at the CBI at Centre Point so is well placed to assess if they’ve achieved this. Kellaway challenges CBI’s head of HR Elaine McFarlane: “Do you think that it’s actually true that if colours are bright then people are more vibrant?” The CBI thinks so and we agree. One of the most common gripes from employees in the workplace is about drab interiors – this isn’t a complaint you are likely to get at CBI HQ. When we produce an office design, we typically find that the client will temper the amount of colour used and the ‘safe’ option tends to triumph. It is therefore refreshing to see the CBI’s use of bright colours on the office walls, on carpets in meeting rooms and on desk screens and storage units. Kellaway says how she thinks that “the canteen is the most revealing place about an office” and that the CBI hopes that staff will use their own canteen or hub to “get together and share ideas.” This is the most striking difference between Cannon Place and Centre Point. With the previous office being over two floors there was a divide between departments and no social space. This hub is likely to foster a much improved collaborative culture between the organisation’s ‘thinkers and doers’. Kellaway complains that she thinks that the office is “too quiet”. I disagree as low levels of noise in an open plan office is important for the CBI. Many of its workforce behave the way that academics or students do – in isolation with a need to concentrate on the task in hand with minimal disruption. Indeed, this ambition is also likely to be shared by a team of developers working for a digital agency. Kellaway says how she is “concerned about the focus on fun” in the CBI’s new home and that “work isn’t fun because its work.” We don’t find that this is the culture or mind set for the majority of our clients. Many are looking to deliver workplace designs that people can work, rest and play in. Pool tables, drinks fridges and games consoles are good examples of making an office fun when you want it to be. The CBI has traded Soho for the City and I know where I’d rather spend my lunch hour, which is likely to bring a greater reliance on Cannon Place’s facilities. Kellaway feels that the CBI’s ambition for its new premises “to make the same old people more sparky” hasn’t entirely worked. She’s probably right, some staff are unlikely to have changed their working practices at all. On the flip side, the CBI moved to Cannon Place with a number of young directors and a pool of recent graduates. The new office may well help more of them to stay at the CBI and develop their careers there. At Centre Point many of the policy team were poached by CBI member firms or took roles in government. In conclusion, the CBI still appears to exhibit much of the culture that it has always possessed. The ‘voice of business’ is still thoughtful and considered and rightly so. 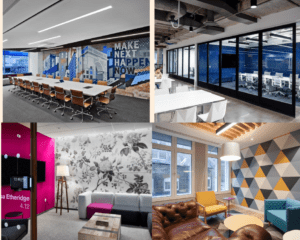 However, it has a modern building, furniture and interior design, which is very much in keeping with the changes it has made – in particular to its senior management team – over the last ten years. A new workplace design can change your company culture. But I think it is more important that your office design supports and reflects your existing culture. In the case of the CBI, Cannon Place better caters for the individual and collective needs of its people. The design is also younger and more modern, which better reflects the profile of its workforce. Does your workplace design reflect your company culture? If it doesn’t, talk to us and let us know about the changes you want to make to your workplace.